Unavowed is the latest point-and-click adventure from Wadjet Eye Games. Unfortunately, it’s not on iOS yet, but I decided to cover it anyway. This is the fourth part of my walkthrough guide and will take you through the third case at St. George Ferry Terminal in Staten Island. You can watch my walkthrough video for Staten Island or continue below for me step-by-step guide. 1. Again, talk to Mandana and Eli. You can also talk to Logan now. He and KayKay are with Kalash. When you’re ready, talk to Kalash and when you’re done listening to him, have him call for a meeting. 3. Head right first. Another vision! It’s of your demon summoning a mer-folk and making a deal with him. 4. Once you’re done talking about it, head back left and then left again. A woman named Vicki is arguing with a cop and then leaves. Talk to the cop. As an actor, I told her I work for a paper and she agreed to talk, but then got stuck in a loop saying, “it was a tragedy.” She must be brainwashed or something! 5. Continue left to Vinny’s Bar. Vicki’s here again arguing with Vinnie. He also repeats “it was a tragedy.” Go inside and talk to Vinny. Learn what you can from him about Vicki. Keep talking, ask him about his dead wife, and he’ll soon end up in the tragedy loop, too. Oh no! Leave the bar. 6. If you have Logan with you, head into the alleyway to the right and have him talk to the ghost. She won’t say much, but she’s probably Vinny’s dead wife. We need to find out her name. 7. Head left to go back to the cop guarding the body and ask her about Vicki. She mentions a family BBQ. 8. Go back to the bar and head right. Keep going right past J&M storage. There’s a bus stop and Vicki Santina is arguing with a cop named Donny. Talk to Donny. Find out as much as you can about Vicki. Donny is her brother, Vicki was shot, and since then she’s been acting crazy. She also lives below Vinny’s bar. Ask him about the BBQ. 9. When you’re done talking to him, head inside the police station. Ask the cop — Captain Joy Harrison — at the desk about Vicki. Ask about her scuffle with Vicki at the BBQ. She says Vicki threw the invitations on the BBQ. Also, she tells you Vicki’s wife’s name. So you now know the ghost’s name is Marlene. 10. Go back to Vinny and ask him about Vicki living in his basement. He won’t let you down there. If you keep pressing him, you’ll also learn that he doesn’t have the code for the door because Vicki set it herself. So we have to figure out the code. 11. There’s a locked door here and you have two ways to open it, depending on who’s in your party. If you have Logan with you, have him talk to the ghost and mention her name, Marlene. Get all information from her and send her off. She mentioned a key hidden under the cinderblock. So check under the cinderblock for the Alley key and use it to unlock the door. If you have Eli with you, ask if he can fire read something for you and then say that Vicki burned something at the BBQ. Now you can see the invitation! 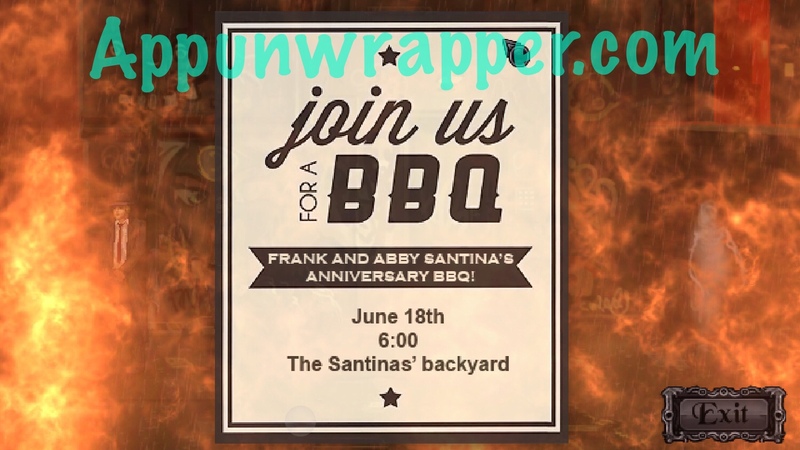 It says the barbecue was on June 18th at 6:00 in the Santinas’ backyard. It’s different each game, though. So, oddly enough, Vicki used the BBQ date as her passcode. I guess it was an important day to her? The date is different each game, but just take the month and day and put them together. So for me, June 18th is 06/18. The passcode is 0618! Enter that in the keypad by the door in the alley and go inside to Vicki’s apartment. If you used both methods to unlock the door, you’ll get an achievement. 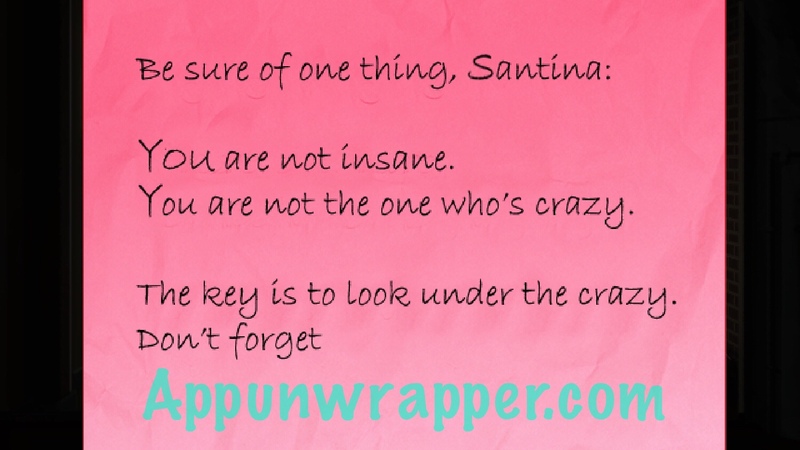 You are not the one who’s crazy. The key is to look under the crazy. 13. 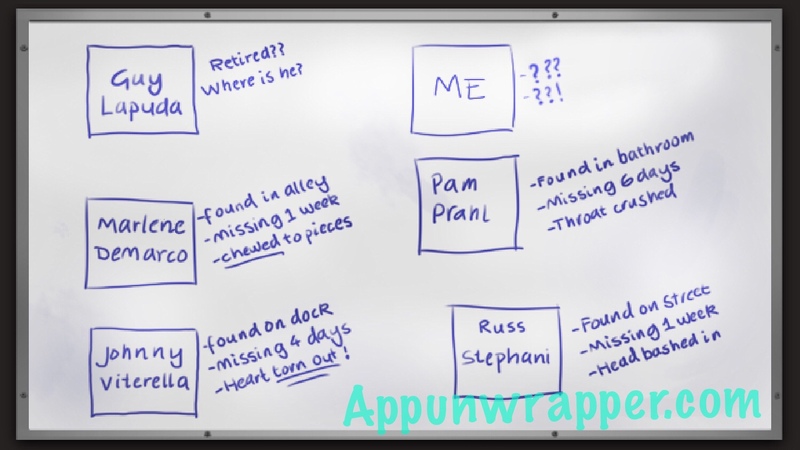 There’s also a whiteboard with info about different people who were murdered or went missing. She thinks she’s next?? 14. The red note said the key is to look under crazy. So let’s do that literally. Look at the writing on the wall that says YOU ARE NOT CRAZY! 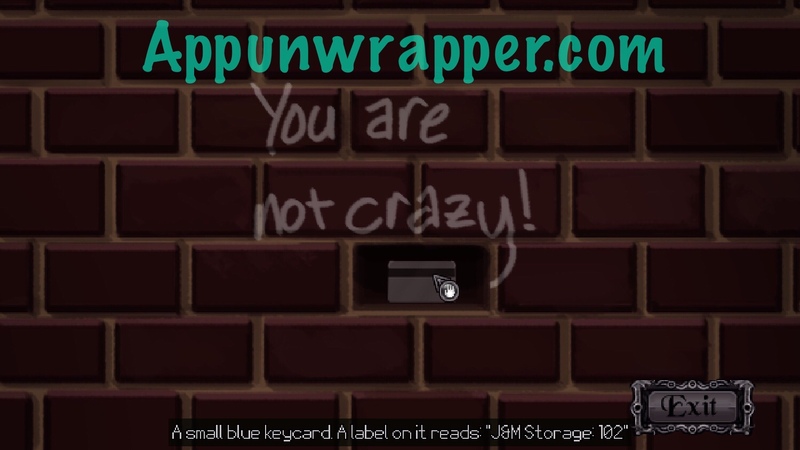 Use the butter knife on the red brick right below the word CRAZY and take the key card for J&M Storage 102. 15. Leave and meet Vicki in the alleyway. She recognizes you and points a gun at you! She says there was an APB our for you for months. Talk to her to learn more about how she started seeing supernatural beings. She wants to arrest you. Eli talks her out of it. You offer to let her join the Unavowed but instead she runs off. 16. Leave the alley and head into J&M Storage. Use the key card on the reader to the left of storage unit 102. Then head inside. Vicki shows up again and locks you in! Chat with her until Donny arrives. He tries to kill Vicki! 17. Now you’re playing as yourself again, inside the storage unit. If you have Eli with you, use the butter knife as a screwdriver and open the panel over the sprinkler system. 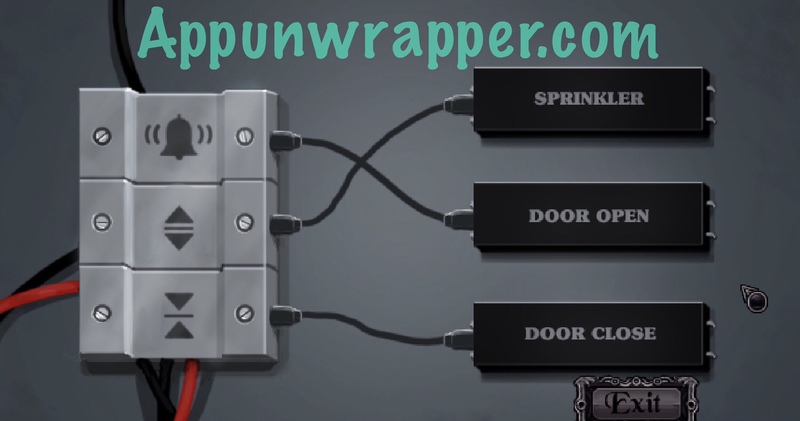 Switch the cables around so that the sprinkler system actually opens the door. Then have Eli use his fire on the sprinkler system. It’s a little tricky because it’s on the ceiling near your inventory. If you don’t have Eli in your party, you can have Mandana use her sword to pry open the vent and then have Logan help her. 18. The door opens and Eli saves the day. You learn that Captain Harrison is behind all the killings. Vicki decides to join your party, but that means you have to say goodbye to Logan or choose between Eli and Mandana if they’re they ones with you. 19. Your team will chase Harrison onto a moving speedboat. Talk to her and learn what you can. She’s been working with the merman General! 20. The General arrives and has a chat with you. Then he starts chasing you! If you have Eli with you, examine the control panel and open the sliding panel to get a gas can. Throw the gas can at him and then have Eli throw a fireball at him. He’ll stop chasing you and give in. He agrees to go home. If you have Mandana with you instead of Eli, go to the control panel and lower the flag. Have Mandana climb onto the flagpole. Then go to the controls again and stop the boat. Mandana will automatically strike the General with her sword. 21. Now you have another choice to make. I decided to have him take Joy Harrison with him because I don’t trust her. But uhhhh the outcome is not ideal. You should allow the General to live either way so he can help you later. Anyway, the case is closed, Vicki is now an Unavowed, and you head back to headquarters for another case. Escape Game: “The Drifting Locked Chamber”: Review: Can you find your way off this ship at sea?